Guess where I want to be? I'm wearing green. This is yet another ploy by you to get me to pull down my pants, isn't it? I'm guessing your Benevolent Employer didn't buckle. Damn them and their non Irish-workshy ways. You want to be at the bottom of the glass? I think before and after pictures should be in order. 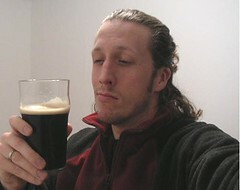 Or an action shot of downing a pint of guiness. Did you by the way hear that they prolonged the opening hours of the pubs in the UK? Texas Sarah? I'd rather be known as Hot Super-Awesome Uber-Cool Sarah. But whatever. Texas Sarah works if Texas is short for Hot Super-Awesome Uber-Cool. That headline says Gloryosky for St. Paddy's or I'm a Finn. you DO have a ponytail, chris cope! you are lucky you are already hot. Rich, quit your bitching, jerky! You're starting to sound like Raisin. "What about me? What about Rich?" God bless you and your terrible eyesight, Crystal. I don't usually wear it in a ponytail, but that won't be a problem after tomorrow -- I'm getting a proper haircut. You got it right, Kylee. Bram, as well.